I updated my iPhone from iOS 10.0.1 to iOS 10.0.2. I did not have any issues with Straight Talk Wireless. 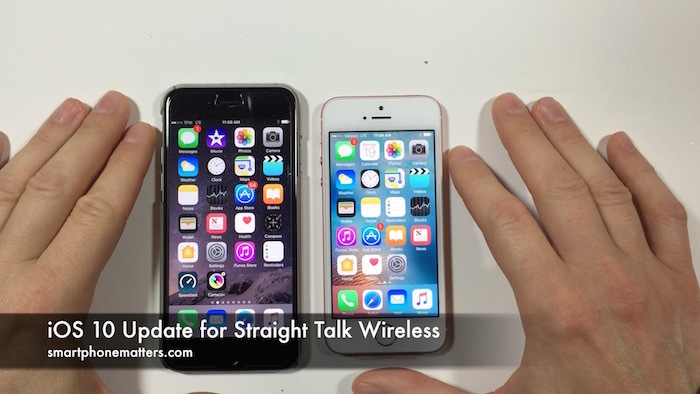 I update both my iPhone 6s using Straight Talk’s AT&T network and my iPhone SE using Straight Talk’s Verizon network. My voice and data work and I am still able to send and receive MMS picture messages. The carrier bundle for my iPhone 6s remained TFW 25.0. The carrier bundle for my iPhone SE is Verizon Verizon 25.1. Last night I updated my iPhone 6s and iPhone SE to iOS 10.0.1. I am happy to report that both of my phones are working with iOS 10. My iPhone 6s uses Straight Talk’s AT&T network and my iPhone SE uses Straight Talk’s Verizon network. I know that some smartphonematters readers like to wait to see how well updates work for me before they install them on their own iPhones. Both of my iPhone’s are now using iOS 10.0.1. The dot 1 means that Apple has already released one update for iOS 10. 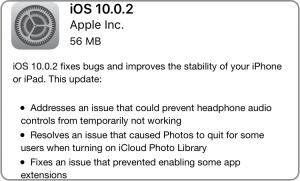 Supposedly, some iPhone users had problems installing iOS 10 and Apple needed to release an update to fix the problem. I had no problems installing iOS 10.0.1 on either phone. Before installing iOS 10 its a good idea to do a full backup on your phone. Updating to iOS 10 will not erase any data from your phone, but it’s smart to have a backup you can revert to if something goes wrong. I backed up my iPhone 6s using iTunes on my Mac. I did not backup the iPhone SE as it doesn’t have any important data on it. After backing up your iPhone, check to make sure that your Straight Talk service is working on your phone. Make sure that you can make and receive phone calls as well as send and receive text messages. It’s really important to check that you can send and receive MMS picture messages. I recommend doing this with someone that does not use an iPhone so find someone with an Android phone. That way you’ll know the picture messages were sent using MMS rather than using Apple’s iMessage over your cellular data connection. After checking MMS, I recommend using the Speed Test app to make sure your cellular data is working and to measure the data speeds. After the update, repeat the process. Make sure you can still send and receive MMS picture messages. Use Speed Test again to make sure your cellular data works. Compare your current speeds to results from before the update. If your data speeds dramatically dropped you may be having a problem with the update. As I explain in the video, I did all these things and my iPhones are working well with iOS 10 so far. Obviously, iOS 10 is new and their could be other problems but so far I haven’t had any issues with Straight Talk. What about you? Have you installed iOS 10? Or are you playing it safe for a while? Leave a reply below and share. Okay, thank you!! That was driving me nuts. I figured it wouldn’t work since it’s not actually through Verizon, but it doesn’t hurt to ask! I’ve been doing google searches for days on it and haven’t been able to come up with anything. Straight Talk and Tracfone have no idea what HD Voice is, but they claim I have it on my phone and it works! I truly appreciate your help. Maybe you should work for Straight Talk! You are welcome. Unfortunately, Straight Talk’s support department doesn’t seem to be equipped to answer questions like that. Do check out Total Wireless and Verizon prepaid if you get a chance. One is less expensive and the other offers a lot more for your money. I contacted TFW & Straight Talk but neither could understand what I meant, even when I read it to them verbatim. I can send you the pics of the steps I take to get there and what it tells me. I can’t add them here to show you. Everything on my phone works fine, I’m just trying to activate lte for both data and voice. OK, so you are able to make calls and you are able to use data. What you are trying to do is activate Voice over LTE. Verizon calls this feature HD Voice and bundles it other feature like WiFi calling and voice and data at the same time. Well, Straight Talk’s Verizon network doesn’t support it. Only Verizon’s own prepaid network is the only one that does. They added support for it last fall. See my YouTube channel for a bunch of videos about Verizon prepaid. Me again, I should mention everything else on my phone works well. I just updated iphone to iOS 10.3 but I’ve never been able to activate voice and data from day 1. It only allows data. Can you clarify …You don’t have voice and data? You are not able to make or receive phone calls? Hi, I currently have Straight Talk on my iPhone 6S Plus. My phone shows TFW, but supposedly goes through Verizon towers. I’m trying to activate Lte voice and data but it won’t allow it. It says contact your carrier for troubleshooting. I did and they kept me on the phone for 2 hours and I still had no answers because they didn’t understand my question. I tried speaking with both Tracfone and Straight Talk at least 3 times each. Please help!! Anyone!!?? Thank you in advance!! What are your APN settings? I have straight talk for my se and my carrier says HOME. I can’t seem to find any settings that allow me to send MMS. Thanks for the quick response. Phone working perfectly now. Have a great day ! I have a Verizon phone, I paid it off unlocked it and went to straight talk . Then I purchase the kit inserted three straight talk chip into my phone it will make calls but will not connect to the Internet. Help please !